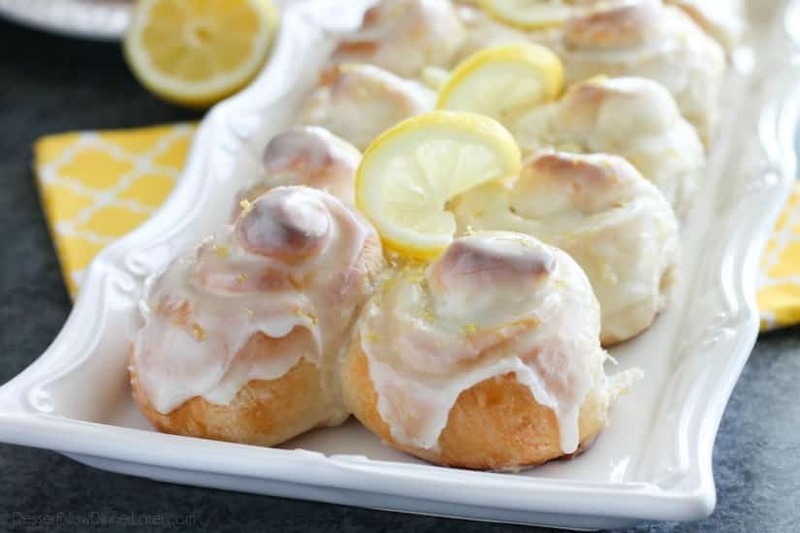 Lemon Cream Cheese Sweet Rolls - Dessert Now, Dinner Later! 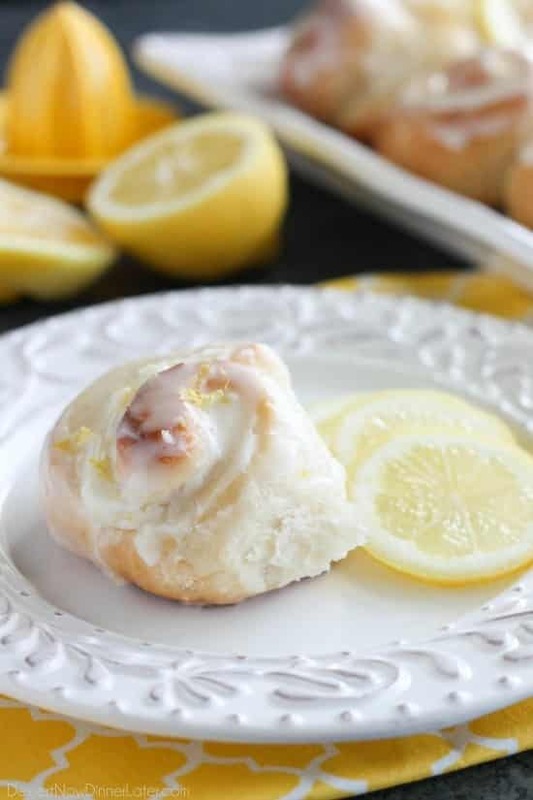 Lemon Cream Cheese Sweet Rolls are tangy and sweet with a hint of cream cheese, plus easy to make with frozen dough! 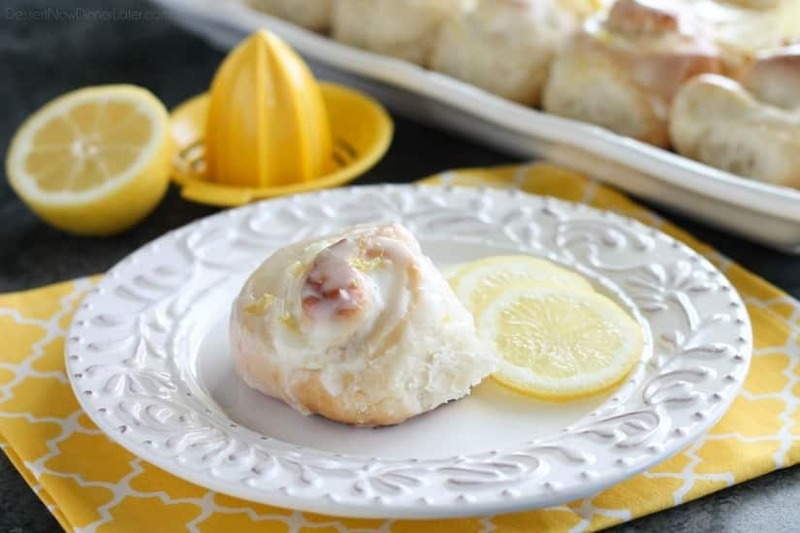 Spring and lemon desserts go hand-in-hand and these Lemon Cream Cheese Sweet Rolls are soft, sweet, and creamy, with bright lemon flavor. I don’t know about you, but where I live, the weather has been very extreme lately. We went from crazy amounts of snow and THREE cancelled school days (which is a big deal in Utah), to rain and flooding, and then dry, sunny, and wonderful. I don’t mind the beautiful sunny 60-70 degree weather, but it’s crazy to think that only a few weeks ago we were surrounded by snow and rain, and so much water that people’s basements were flooding. It was a crazy hectic way to end the winter season. 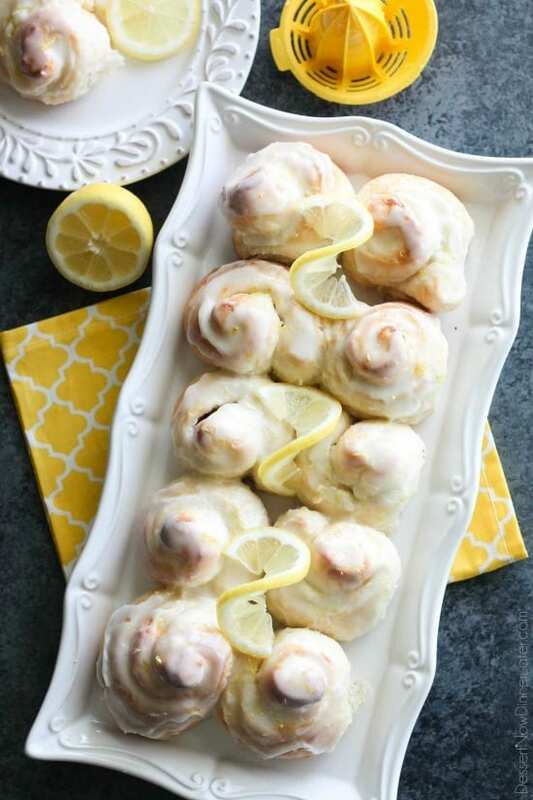 If it was still snowy, these types of lemon desserts are what pull me out of that winter funk that you get in from not being able to go outside, but are huddled up by the space heater all day, every day. 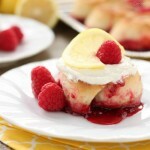 Lemon desserts brightens my mood like the sun on my skin! I’m definitely not complaining about the sunshine we are getting though. I’ve dusted off the jogger stroller and my kids’ bikes and we are off to explore! It’s wonderful! 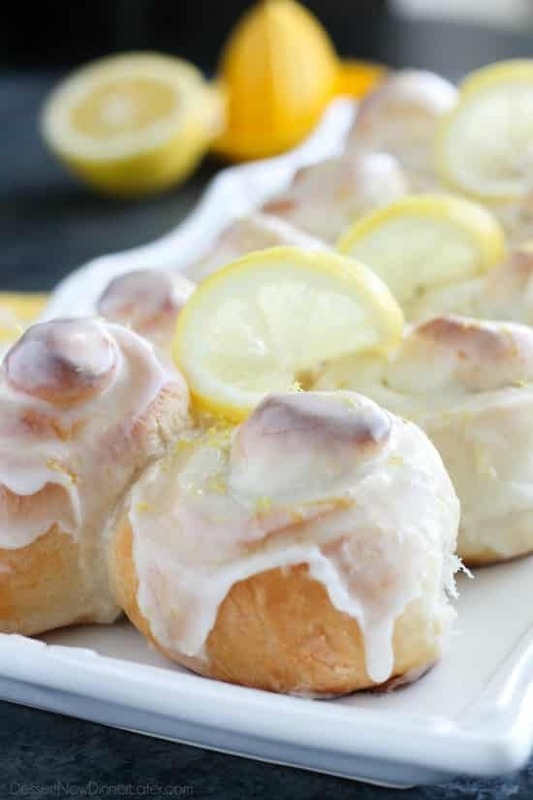 These Lemon Cream Cheese Sweet Rolls are the icing on the cake for this beautiful weather we’ve been having. 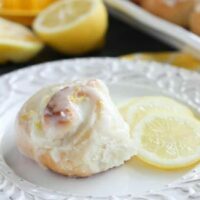 Your Easter brunch deserves these Lemon Cream Cheese Rolls, and they are so easy to make with Rhodes frozen dough! No worrying about getting the yeast dough right, just thaw it, roll it out, spread the filling, rise, bake, glaze, and enjoy! Recipe added 7/5/17. 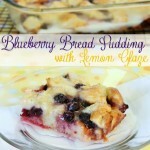 For a step-by-step photo tutorial, visit the Rhodes Bake-N-Serv Blog. Roll the dough into a large rectangle about 12-inches wide by 18-inches long. Use a light dusting of flour if dough gets sticky. In a small bowl, mix the cream cheese, granulated sugar, lemon juice, and lemon zest with an electric mixer until smooth. Starting with one long side of the rectangle, carefully roll the dough into a log keeping the filling tucked inside. Pinch the seams and place the roll seam side down onto parchment paper or a silicone baking mat. Using floss, cut the rolls into 12 even pieces. Tuck the floss underneath the dough, then criss-cross the floss and pull outwards until it cuts through. Dip the floss in flour if it sticks to the dough. The floss helps cut the rolls without smashing them. Pick up the parchment paper or silicone baking mat and place it on a baking tray. Arrange rolls so they are 1-inch apart, in 3 rows of 4 pieces. Be careful not to squeeze out too much of the filling. 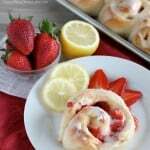 Cover the sweet rolls with sprayed plastic wrap and let rise for 30 minutes in a warm place. Bake at 350 degrees Fahrenheit for 25 minutes or until golden brown on top. Let rest for 5 minutes. 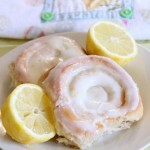 In a small bowl, mix the powdered sugar, lemon juice, and lemon zest until a thick glaze is formed. Spoon over warm rolls spreading the glaze evenly. Enjoy warm!